The ability to produce fluent, legible handwriting with ease is something that affects attainment in most areas of the curriculum, yet many children continue to struggle with this vital skill. 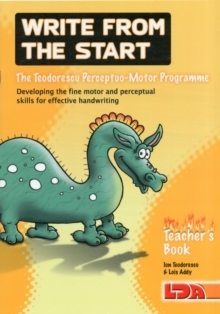 Based on holistic principles, this programme offers a different approach, developing the muscles of the hand - so that children gain the necessary control to produce letter forms - alongside the perceptual skills required to orientate and organize letter and words. The programme is effective for mainstream children aged 4-6 years, children with developmental co-ordination disorders and older children with mild to moderate learning difficulties. Over 400 carefuly graded exercises and activities develop hand-eye co-ordination, form constancy, spatial organization, figure-ground discrimination, orientation and laterality. The package consists of two pupil workbooks and a teacher's handbook.